Resource West specializes in industrial evaporators, industrial fans, ventilation systems and above ground tanks. The company extends service beyond simply supplying products. It prides itself on the quality service and support to continually improve its products with the newest, most efficient and reliable innovations. Resource West’s goal is to optimize and maximize the operations for the client. Above all, service with safety is the company’s highest priority. Resource West has developed an extensive network of value-added services and take pride on its unmatched service, safety and support. Resource West Enhanced Evaporation Services offers three evaporator styles to suit a wide range of needs and budgets. The Landshark evaporator is offered in various mounting styles and is designed for larger evaporation ponds or an area where overspray is possible. The fan’s airflow produces a large spray pattern that allows longer float times, resulting in greater evaporation rates. Evaporation rates depend greatly on weather conditions, such as ambient temperatures, relative humidity and wind speed. The Barracuda is a variation of the original Landshark evaporator design with a lower flow rate. The Barracuda offers the same flexibility as the Landshark but is designed for smaller evaporation ponds or an area where overspray is more of a concern. 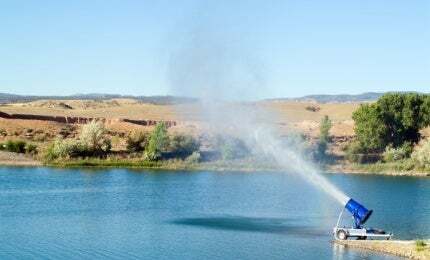 While land-based evaporators are more prone to shut down due to strong winds, the Apex floating evaporator continues to work in the same conditions, as the spray plume is closer to the pond surface and is more likely to drop back. Once on the pond, the mobility of the Apex enables operators to adjust its location to compensate for wind direction, leading to greater net evaporation rates and the increased runtime allowed by the in-pond location. SMJ Fans designs custom axial flow fans, scrubber systems, starters and accessories for a wide range of applications and industries, such as mining, tunnelling, marine and power generation. SMJ also offers customized permissible fans, silencers, primary ventilation, tunnel ventilation, face fans and contra-rotating axial fans. SMJ scrubber systems are laboratory-tested (NIOSH 0500 & 7500) and exceed US Mine Safety and Health Administration (MSHA) and American Industrial Hygiene Association (AIHA) standards for coal dust, quartz, cristobalite and tridymite. Resource West’s Commander Series Tanks come in four different sizes and offer quick setup and demobilization. The company’s above ground storage tanks are designed with a focus on safety and reliability and are developed to be more cost-effective in comparison with conventional storage tanks, while providing an innovative and efficient water storage solution to customers. Commander Series Tanks offer flexibility in design with four sizes, ranging from 9,000bbl (378,000gal) to 51,000bbl (2,142,000gal), to accommodate the requirements for the customer on any given location with the option for rental or purchase. To help with heat loss and freezing conditions from cold weather elements, the Commander Tank can be insulated. An optional cover is available to minimize potential heat loss, saving time and money in the water heating process. With a setup time of one day, Resource West’s tanks offer a convenient solution for water storage, while significantly reducing transpiration costs and heavy truck traffic. Resource West also provides fill stations that are designed as an in-line anchor to facilitate the safe and secure transfer of liquids between any storage facility and transport truck. The main purpose of the fill station is to minimize the hazards associated with liquid transfer and prevent any damage to company assets, such as pit liners, wildlife netting hoses, piping and storage tanks.